And we’re having torrential downpours and tornados in the area, but whatever! Who needs good weather to fly out of a teensy airport? I do, that’s who. Check twitter and Instagram later today to see how delayed I am over a storm 6 hours prior to my flight. I mean, really. So when you have a hunch that your flight will be cancelled or delayed you just really might need some comfort food, right? 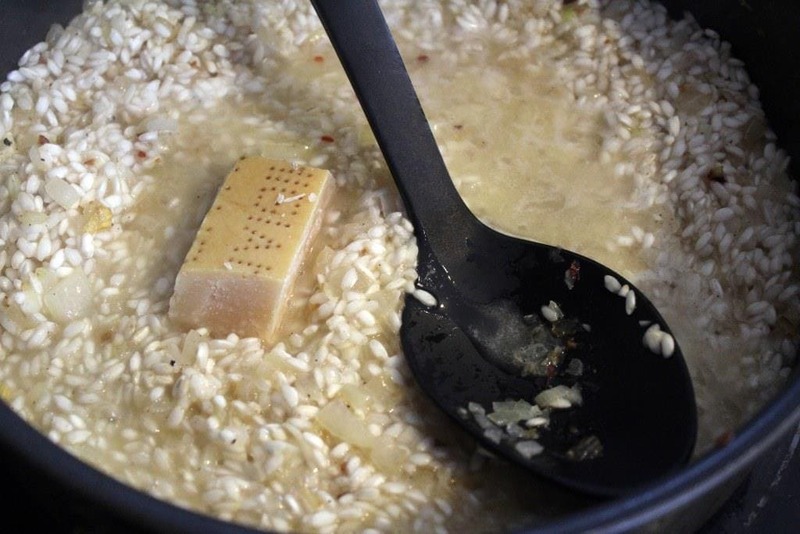 This risotto will fit. the. bill. You don’t even know. 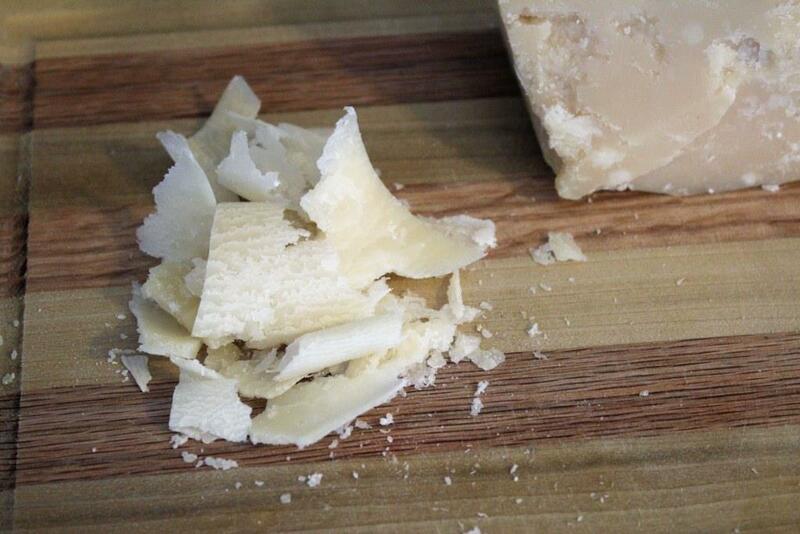 This is super simple, but we get a TON of flavor from parmesan rind and the good parmesan. 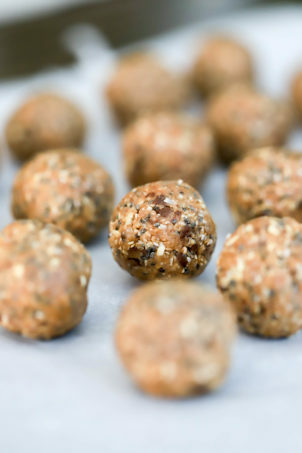 The kind that you only need a teeny block of to impart HUGE flavor. So, splurge. Also, breaking arborio rice news. You know those big plastic square-ish containers that they sell fancy rices in, and they’re totes expensive? Look right below those. Where the bagged rice is. My super cheap store now has a brand of arborio rice in bags, and per ounce is about half the price of the plastic box stuff. So, look around for cheaper stuff before you whine to me that arborio rice is expensive. It’s not that bad! 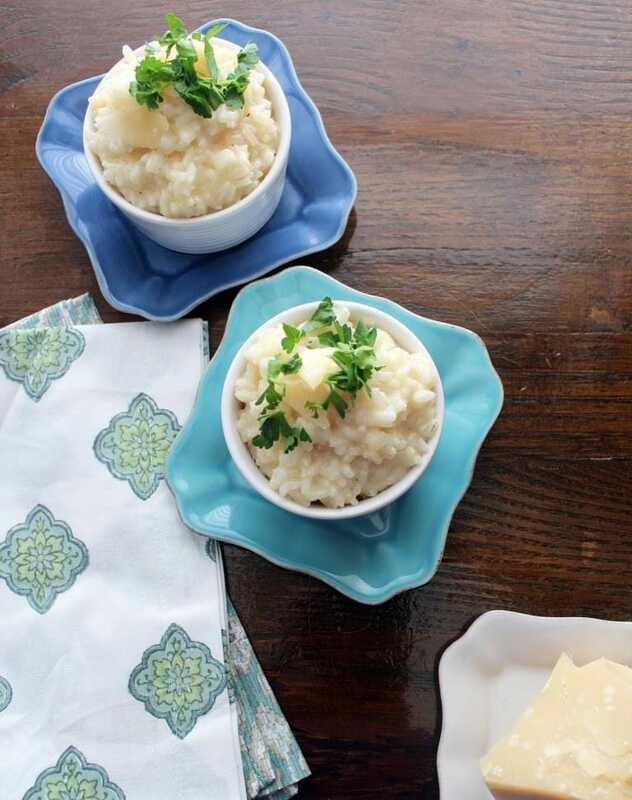 Creamy risotto can make everything better, really. Let’s make it! 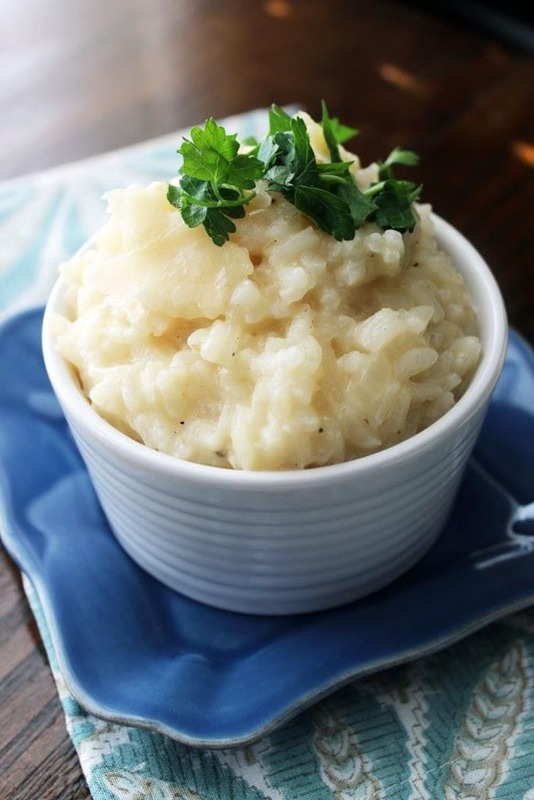 You need arborio rice, white wine, onion, garlic, butter, broth (I like chicken, but veg is fine! 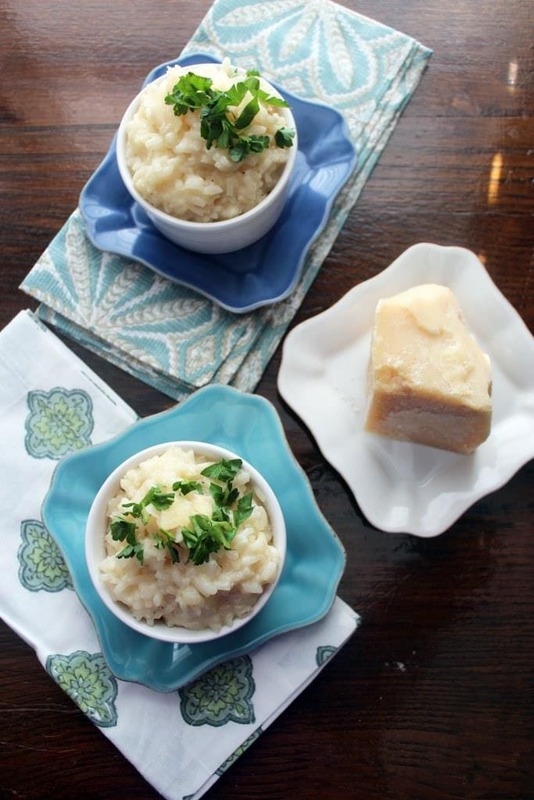 ), fancy schmancy parmesan with a rind, and fresh parsley. Maybe some salt and pepper or crushed red pepper, too. Your call. First, finely chop the onion. 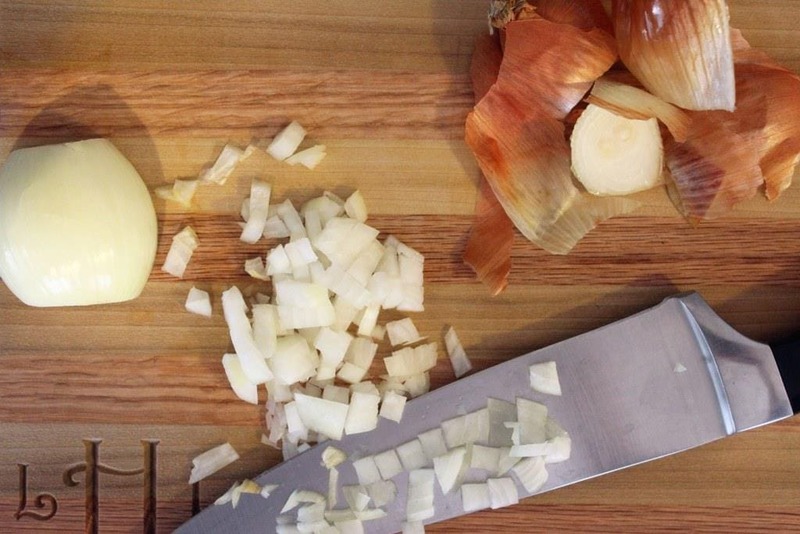 We’re making six servings here, and one SMALL onion, is good for that. We aren’t making onion risotto! 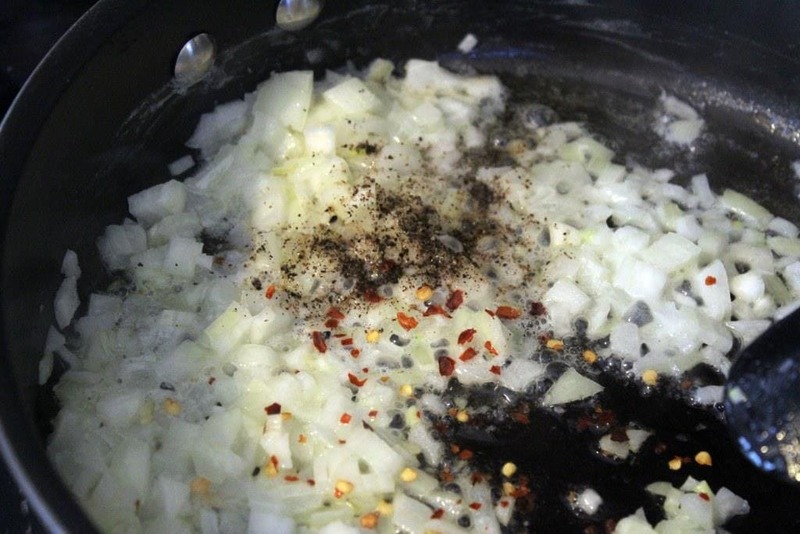 Add the onion to a large skillet over medium-low heat with the butter and a sprinkle of salt, crushed red pepper, and black pepper. The peppers add heat to different places on your tongue, which is why I like to use both. If you only have one don’t stress out too much. Stir the onion in the butter until it becomes translucent. 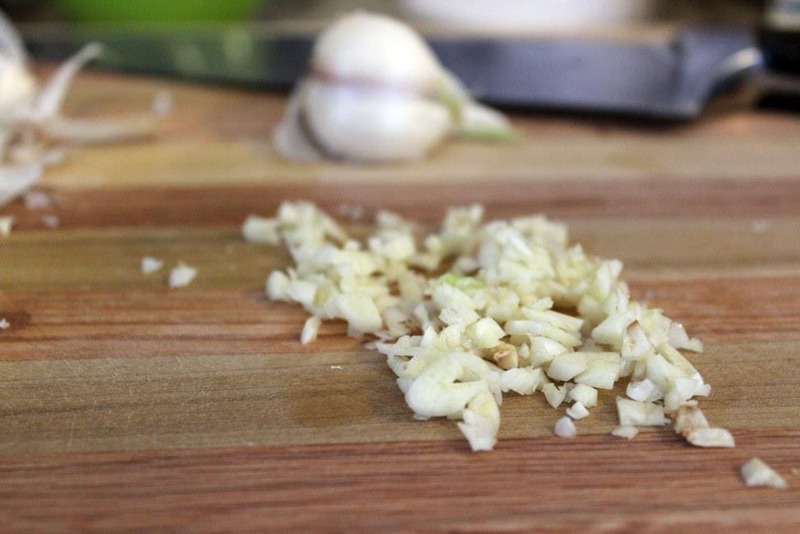 Meanwhile, mince the garlic. When the onion is fragrant and translucent (kind of clear) but not browned at the edges, add the rice and garlic to the pan. Stir to coat the rice in the butter for 2 minutes. Then, pour in the wine! Increase the heat on the stove to medium or medium-high. We want the wine to bubble and reduce rapidly. Now, grab your fancy parm. This is REALLY the time to use it, I promise. Cut off the rind! My parm had a large piece of rind, so I actually cut this in half. And stuck it right in the risotto as the wine was reducing. You’ve seen this done in marinara sauce, right? You drop in some parm rind while the sauce is cooking, and then the whole thing ends up tasting like cheese. NOT A BAD THING. 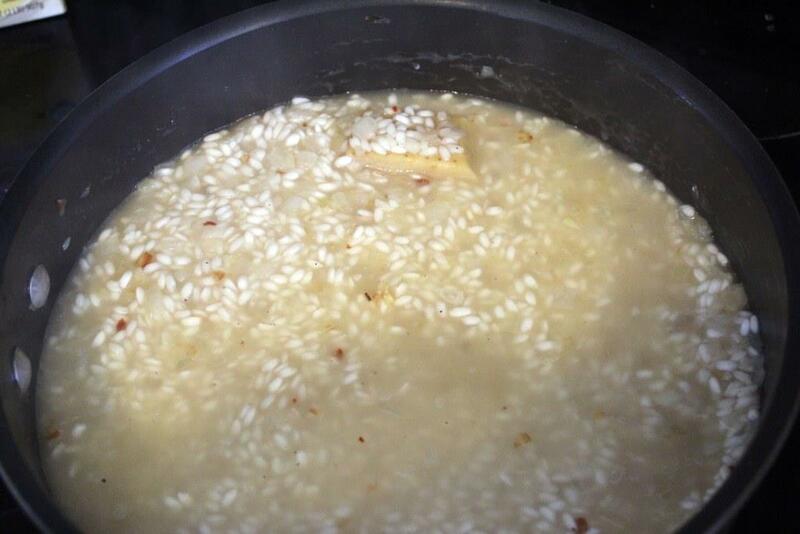 Now, we make risotto like usual. 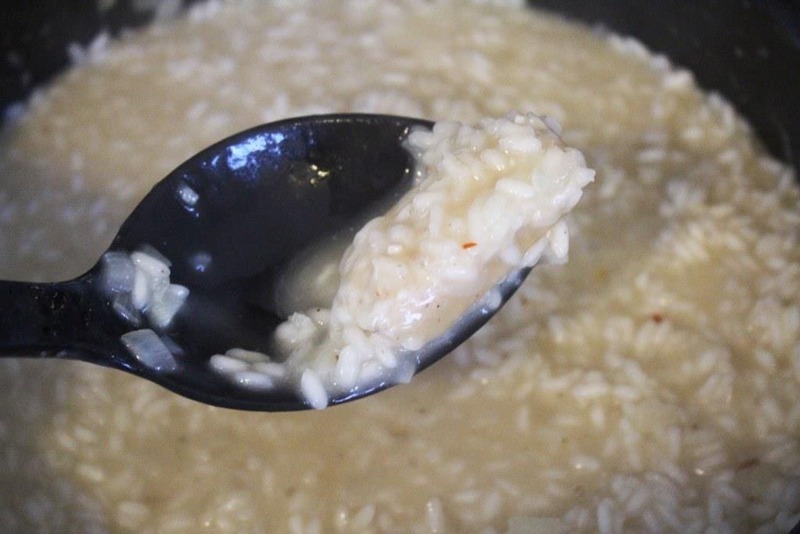 Once the wine has absorbed into the rice, add stock about a cup at a time, stirring often. When the stock is absorbed, add more! 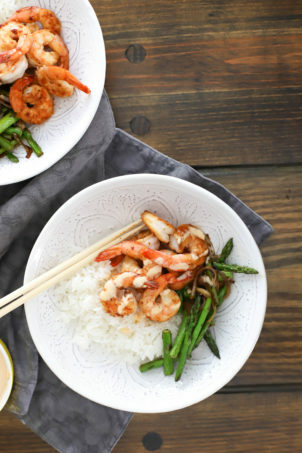 I used 1 quart of stock for this recipe and the rest water so that the rice wasn’t too salty. 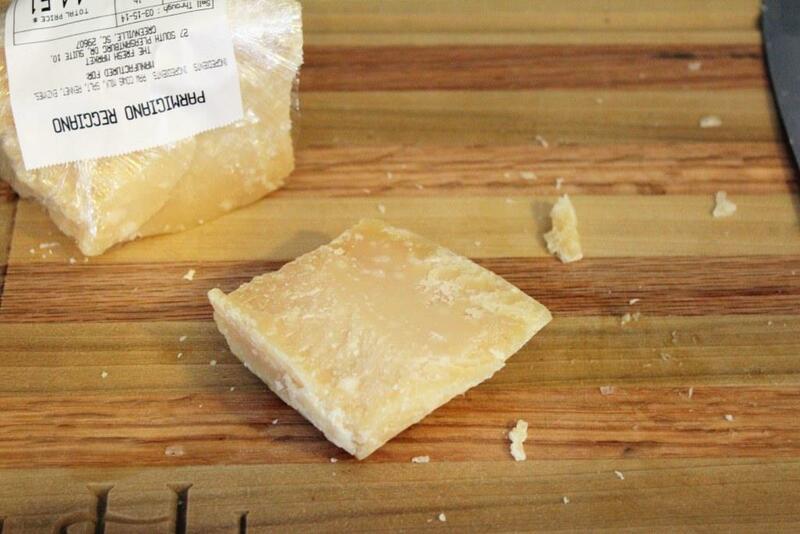 You can use all stock if you’d like, but I don’t think it’s necessary given all the flavor we get from the parm rind. So we’re adding stock, stirring, then adding more. For about 20 minutes, until the rice is plumped and cooked through. This is about halfway there. While that’s happening, let’s prep the rest of our ingredients in between bouts of stirring. 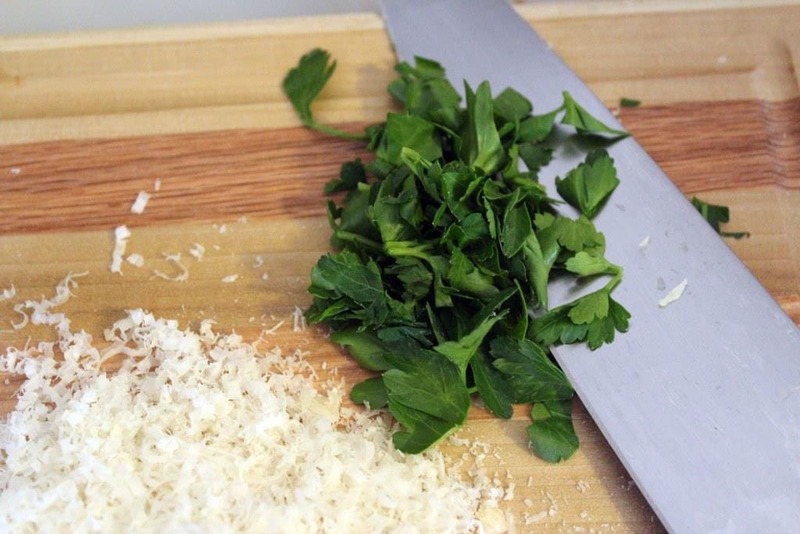 Use a vegetable peeler or sharp knife to make some really thin pieces of parm for topping. 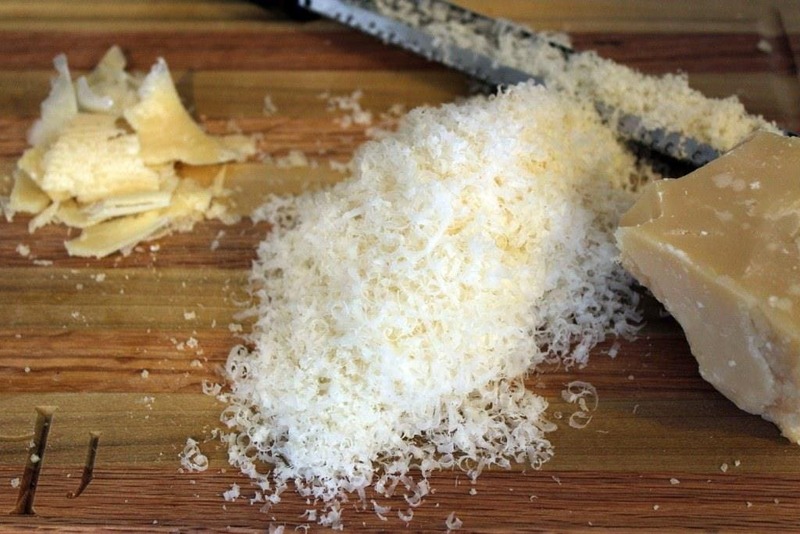 Then use a small grater or zester to grate about 1/2 cup parmesan shreds. THEN, roughly chop some parsley for topping. When the rice seems cooked, taste it! Add another round of water or stock if needed, and add more salt and pepper if you’d like. 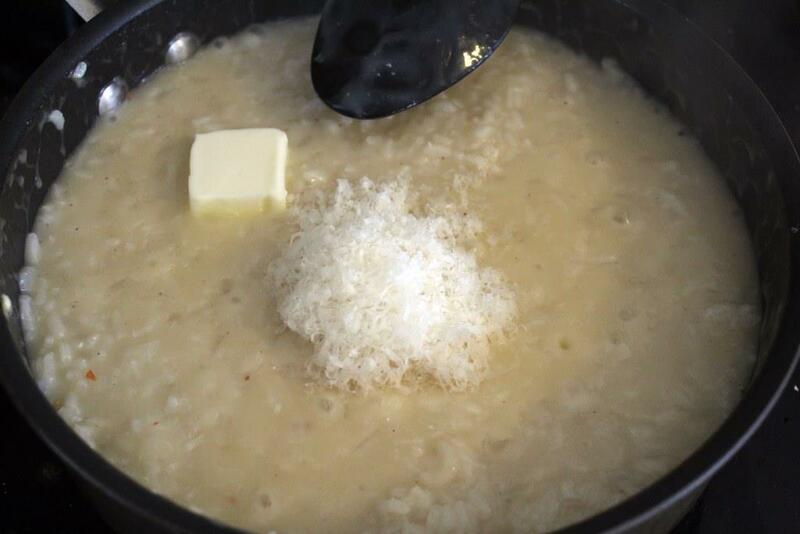 When the rice is fully cooked, turn the heat down and add the shredded parmesan and one more pat of butter. LOOK AT THE RISOTTO! This is so delicious. I promise, friends, risotto is not hard. Just keep stirring. If you feel like it’s getting away from you, say, if you’re trying to do other things at once, just turn the heat down and it’ll cook more slowly while you get your life in order. Promise. 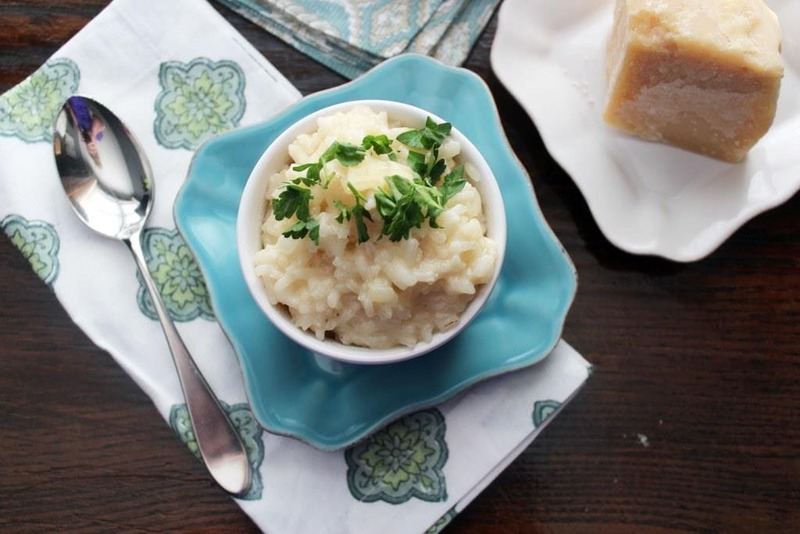 Right before you serve, remove the parmesan rind from the risotto and give it to your dogs. 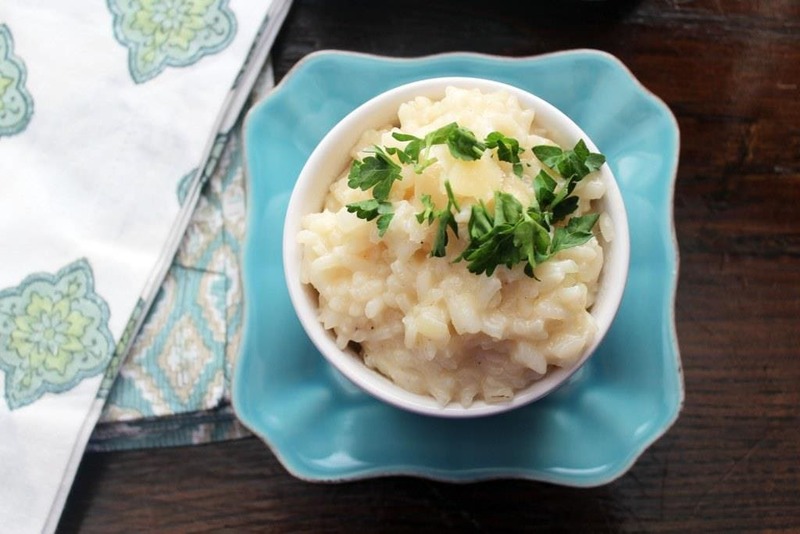 Then top the risotto with the big parm pieces and some parsley, and DINNER! You might want to add some vegetables or protein, but maybe not? I think this would be a lovely lunch with just a side salad. 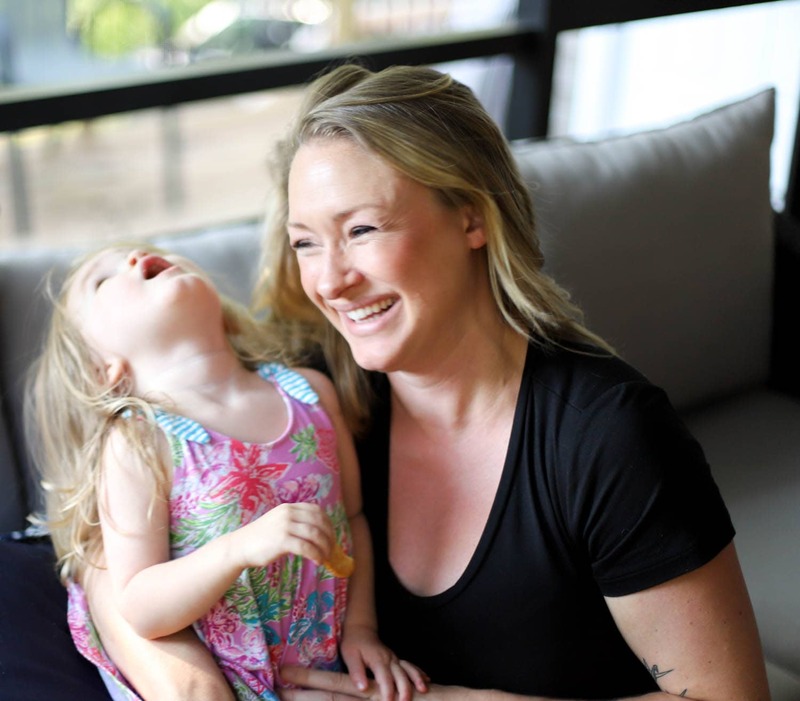 Carbs = energy, right? 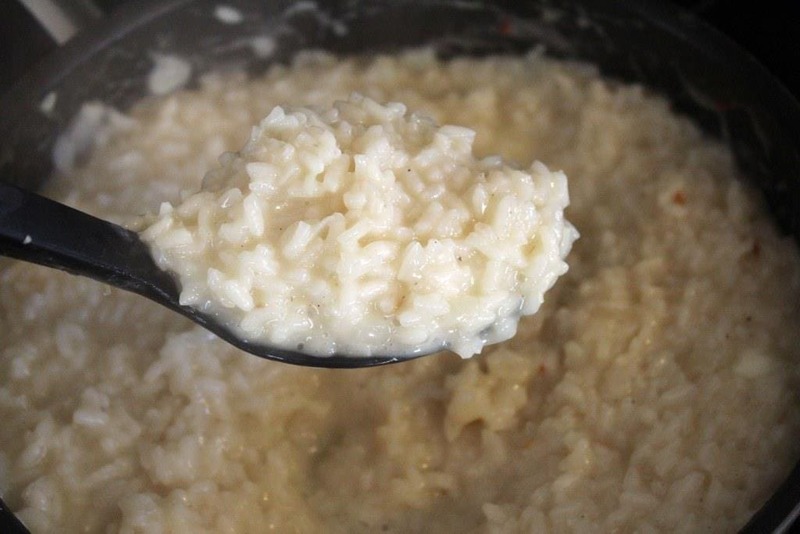 I love flavored risottos, but this plain one with just the light cheese/wine flavor is really great, and lets other parts of a meal shine. Try this soon! It’ll make any flight delays seem like no big deal. In other news, where should I have dinner in Baltimore tonight? In a large skillet, add the onion, crushed red pepper, 3 tablespoons of the butter, and a sprinkle of salt and pepper. Cook and stir until the onion is translucent but not browned at the edges, about 5 minutes. Add the garlic and rice and cook for 2 more minutes, stirring. Add the wine and parmesan rind and increase the heat to medium or medium high - the wine should bubble and reduce quickly. 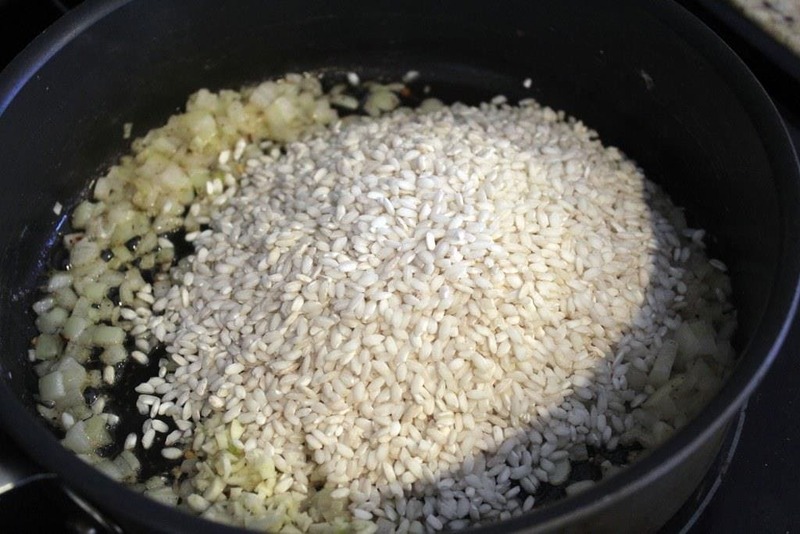 Stir until the wine has absorbed into the rice, then add stock 1 cup at a time, stirring often, until absorbed into the rice, then repeat. 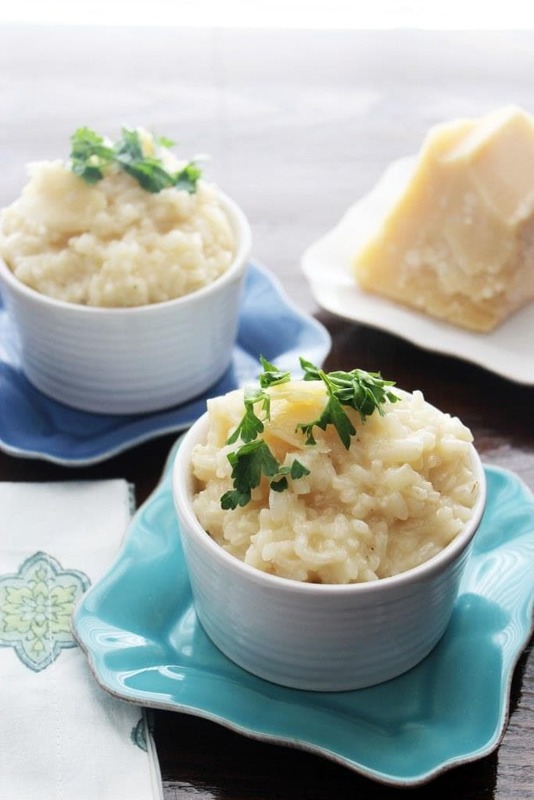 While the stock is slowly cooking into the rice, make a few large shreds of parmesan with a vegetable peeler or sharp knife, and finely grate the rest. When all the stock is absorbed into the rice, taste the rice. 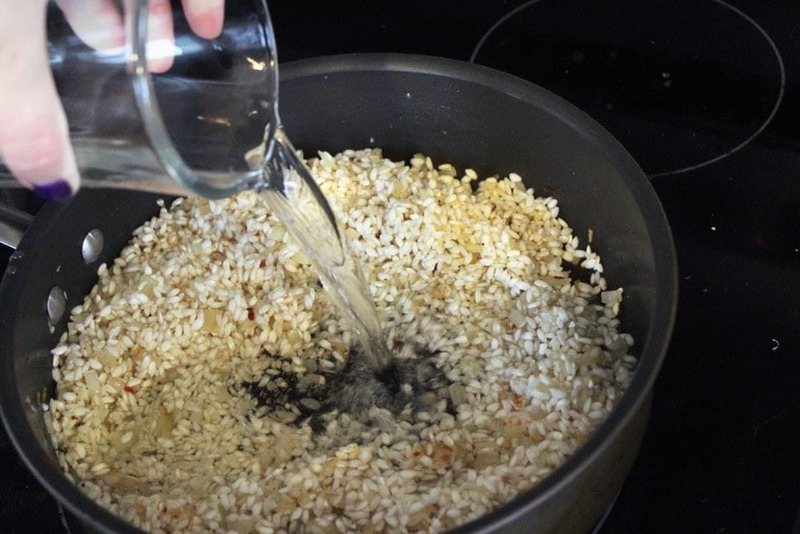 Continue in the same method adding water 1 cup at a time until absorbed and the rice is cooked through, about 20 minutes after you added the first round of stock. Taste again, and add more salt and pepper if you'd like. 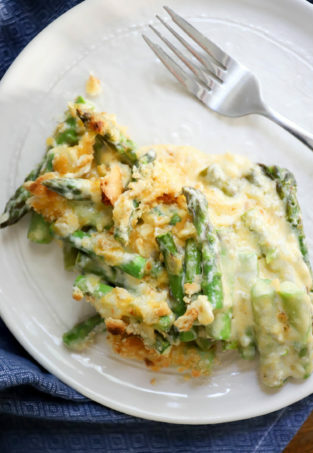 Right before serving, stir in the last tablespoon of butter and the finely grated parmesan. 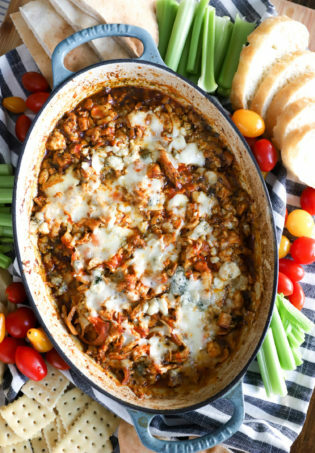 Serve topped with extra parm and the chopped parsley.